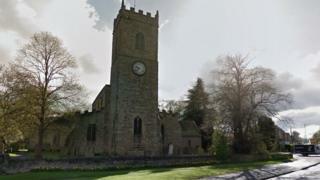 A vicar and his curate who had an "adulterous" affair have quit their posts, the Church of England has said. The Rev Rupert Kalus and the Rev Ali Miller were both married when their relationship began in Lanchester, County Durham, earlier this year. They were suspended from public ministry when the affair came to light. The Bishop of Durham, the Rt Rev Paul Butler, told a congregation at the village's All Saints Church the pair had resigned on Sunday. Mr Kalus, a father-of-three, had been vicar in the parish of Lanchester and Burnhope for 12 years. He was suspended for 18 months and Ms Miller for 12 months, the Diocese of Durham said. A spokesman described the affair as "adulterous" and said the organisation was "deeply saddened" by events. He added: "Following the procedures of the Clergy Discipline Measure, the Bishop of Durham has prohibited both Rupert and Ali from their public ministry for a period of 18 and 12 months respectively. "They have both therefore had to resign their posts. "The Rt Rev Paul Butler, Bishop of Durham, confirmed these facts to the congregation at the normal Sunday service which he led on Sunday 12 August. "We are deeply saddened that this situation has arisen and ask that you respect the privacy of both families and hold them in your prayers."